For awhile now, I’ve been wondering when we’d see our first commercial diesel hybrid vehicle. The combination just makes perfect sense. Modern diesel engines are extremely efficient and clean burning, getting very good mileage on their own. Put one in the center of a hybrid system, and we’re talking miles per gallon currently unheard of in a factory vehicle. Well, Volkswagen just debuted the Golf TDI Hybrid at the Geneva Motor Show. Mileage for the 220 volt electric motor/1.2 liter engine combo is estimated to be in the neighborhood of 71 mpg. 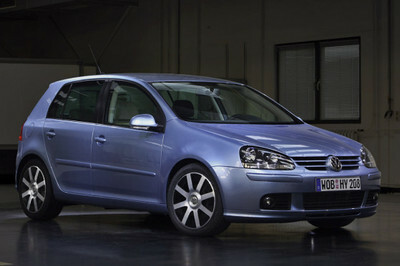 In addition to its normal mode, this Golf can also run in full-electric or full-diesel mode. Oh, and like VW’s other diesels, it can also burn biofuels. The Golf TDI Hybrid is supposed to be available in Europe by the end of the year, but there’s no word yet on availability here in the States. There appears to be a lot of excitement around this car, and for good reason, I believe. Not only does this get a good 20 mpg better than the current hybrid leader, the Toyota Prius, but you could potentially drive it without ever putting a drop of petroleum-based fuel in it. Another plus: VW didn’t design it to look like an ugly space ship.